I'll be honest with you...I've been meaning to do this blog for some time now, but things just...kept...coming...up. Blah blah story of my life. I meant to finish this blog last week..I'm so sorry. 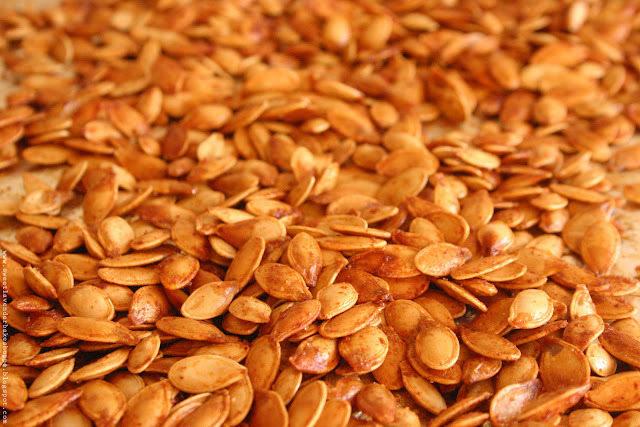 If you're like me and really into roasting your own pumpkins for puree to use in many yummy dishes like pumpkin pie, then you'll find yourself with an abundance of those super yummy and good for you pumpkin seeds. Did you know: Pumpkin seeds are packed with fiber, protein, vitamins (like Vitamin E), minerals, and antioxidants?! Here is where we need that little "The more you know" thing to play...you know with the little shooting star and rainbow thing... So very good for you indeed! 1. Preheat oven to 275°F. Line a baking sheet (or two) with tin foil or parchment paper (or silpats) and set aside. 2. In a bowl add your cleaned and completely dried raw pumpkin seeds you've collected from your various pumpkin excursions :) Or you can just buy some raw ones at your local health food store ;) To thoroughly dry, after cleaning in warm water, I allow my pumpkin seeds from my pumpkin to dry over night on a clean tea towel in a single layer on my kitchen counter. Then I space them out on two sheet pans (baking sheets) and allow to dry another 8+ hours at room temperature. 3. Mix in your oil, clarified butter (or ghee) or coconut oil, garlic, Worcestershire, paprika, cayenne, salt, brown sugar, and agave or maple. Make sure your seeds are evenly coated with the salty sweet mix. 4. Pour seed mixture onto your prepared baking sheet(s) and spread out so that there is an even layer of seeds. You don't really want them on top of each other if you can help it. They'll end up steaming if overcrowded in your pan- try and keep them as one layer so they'll roast easier. 5. Roast in 275°F oven for 30-45 minutes, stirring a few times, or until your seeds are crispy and a golden brown color.